Thank you to journalist/author awesome mom Donna Bryson and the Christian Science Monitor! Pittsburgh Ballet is a pioneer in opening the performing arts to people with sensory sensitivities, including bringing in special education teachers as volunteer ushers and encouraging audience members to do whatever helps them engage. Children with autism clapped exuberantly as Pittsburgh Ballet Theatre dancers kicked and leapt to Tchaikovsky. Pittsburgh Ballet is a pioneer in opening the performing arts to people with sensory sensitivities. Strategies include bringing in special education teachers as volunteer ushers and encouraging audience members to do whatever helps them engage. Christina Salgado, who oversees Pittsburgh accessibility initiatives, said the result can be a bonus for performers. 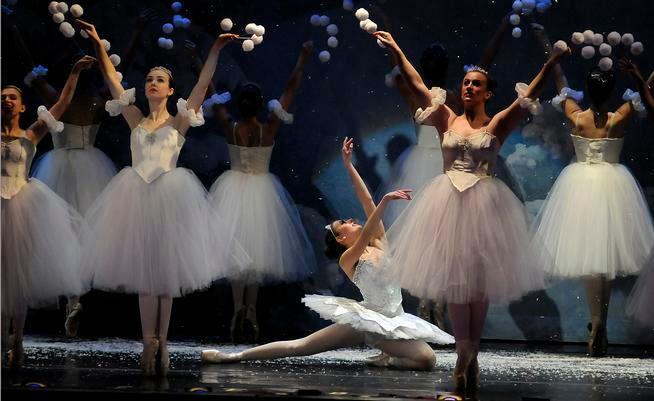 “You could see the joy in the dancers’ faces” as the audience kept the beat during the Russian dance in “The Nutcracker” last season, Ms. Salgado said. When Sarah Marshall was an infant, Mozart calmed her. When she got upset in the car, Gregorian chants immediately soothed her. She found delight in BB King and the blues. “When she started missing her milestones, it became really clear that music was the key to her language skills,” says her mother, Julie Marshall. Sarah was diagnosed with severe autism. But the Lafayette girl, today a 12-year-old middle-schooler, has always been musically gifted. “There’s something about the rhythm of music that organizes her brain. It’s really profound,” says Marshall, who is a violinist herself. The need to reach her daughter via music led Marshall to create BrainSong, an organization that connects professional musicians and concerts with children with special needs. That led Marshall to reach out to the Boulder Ballet and Boulder Philharmonic Orchestra — and form a new partnership to bring the “Nutcracker” ballet to people with special needs. For one afternoon, on Wednesday, Macky Auditorium, on the University of Colorado campus, will open its doors to people who might not be able to sit through or enjoy the traditional, classic show. Colorado’s first ever “sensory-friendly Gentle Nutcracker” with a full, live orchestra will still feature the full sets, costumes and the professional dancers. Broomfield’s Colorado Conservatory of Dance also offers a sensory-friendly “Nutcracker,” going on three years now. This show is 6:30 p.m. on Dec. 16 at the Performing Arts Complex at Pinnacle Charter School, 1001 W. 84th Ave. in Denver. The Colorado Conservatory production uses a recording of the music, which allows them to equalize the music so there are no unexpected peaks or crashes in the score that could alarm the audience. The conservatory also offers a special dance program for children with special needs. For the Boulder show, to accommodate people with sensory challenges, the house lights won’t go to full dark; they’ll stay at about 35 percent, to minimize the visual difference between the stage and the audience. To shorten the length, the show will only feature the second act. The auditorium is setting aside a special “quiet room,” open to anyone who needs some time away from the performance, at any time during the show. And unlike a traditional theater performance, during this show, the audience is welcome to sing, yell, talk or dance along — whatever they need to do to enjoy the experience. The auditorium is also only selling half of its tickets (600), to allow for plenty of space between seats, and people can choose their own seats or even move throughout the show, as needed. To make the show accessible to different incomes, tickets are also discounted, subsidized by a BrainSong fundraising campaign, as well as donors. Because space is limited, it is specifically geared toward people with special needs, such as autism, Down syndrome or even Alzheimer’s, and their families. Malva Tarasewicz, of Boulder, and her son, Benjamin Tarasewicz, will be in attendance. Like with Sarah and many other people with autism, music has always been a bridge between Benjamin Tarasewicz and the people who love him. When he was younger, she says she brought him to musical rehearsals and tried community concerts, but they had to sit close to the exit, just in case. She never knew when he might have an outburst or breakdown, or when uneducated community members might give a dirty look or even tell them to leave — not realizing how crucial exposure to music was for him. “Even if everything else in the day was crummy, the music part was when he’d get more centered, this thinking would become more organized — of your therapeutic goals started to come together,” Tarasewicz says. Even the most severe Alzheimers’ patients who cannot recognize their own reflection in a mirror can recognize a familiar song, research by neurologist Oliver Sacks has shown. Today, Benjamin Tarasewicz, now age 22, has developed his speaking skills, as well as his musical and storytelling ones. (He also enjoys telling jokes on stage.) He will be emceeing the “Nutcracker,” explaining what happened in the first act and also sharing his story with others as a role model. He is a singer in a Boulder community choir, he plays the violin and is teaching himself how to play the ukulele, was a TedX speaker and is involved with other theatrical endeavors, such as a sensory-friendly chamber musical performance of “Peter and the Wolf” at the Boulder Public Library 2 and 3:30 p.m. on Saturday. Both shows are free and open to the public. He has seen the “Nutcracker” before, and he says he’s excited to share it with other kids like him. They did offer a smaller sensory-friendly show at a rec center this summer, for maybe 50 viewers. But this is the first attempt at something of this magnitude. The “Gentle Nutcracker” website (boulderballet.org/the-gentle-nutcracker) also has photos of the show and videos of the trek from the parking lot into the auditorium, as well as a video of the auditorium. Professional volunteers and occupational therapists also will be stationed throughout the theater to help. An EMT will be there to help with transfers. Volunteers are stationed at possible danger points, as well, such as in front of the orchestra pit and at the top of stairs outside of the bathroom. Adams has also helped prepare the performers. (She is one of the dancers, too.) It’s different dancing with house lights on, she says. “We will be able to see the audience and see them moving. That can’t be a surprise to us. Many will be talking and will have involuntary noises they’ll make,” she says. Down in the pit, the orchestra won’t have to make as many adjustments. For this show, the music has no plans to be played quieter or adjusted, says conductor Michael Butterman. Although he says the orchestra will play some examples of their music before the show starts, to get the crowd used to it. He says it was important to the musicians and the dancers to preserve the live music, rather than a recording. First, he says you can hear a substantial difference. But it also contributes to a deeper, more immersive experience, he says. Ultimately, Butterman says, he believes music and the arts are a basic human right. Ana Claire, artistic director of the Boulder Ballet, says the opportunity to offer a sensory-friendly “Nutcracker” is the culmination of two of her lifelong passions. When she was younger, she says she either wanted to go into ballet or work with children with autism. She says the dancers will gain as much from the experience as the audience. She says she hopes to offer ballet classes for people with special needs soon. “I’m just hoping to bring dance to more and more people,” she says. Practice at home. Tell your child what’s going to happen. Listen to the music at home. Provide concrete references about the experience, instead of it being an abstract concept. Maybe even set up a row of chairs at home and model what the show will feel like, says Malva Tarasewicz. “Practice if you start to feel like you can’t handle it, instead of screaming, give my hand a tap and we will leave so you can rest,” she says. Try again and again. “You can do the repeats a bunch of times, even in the same performance,” Tarasewicz says. Repeated exposure often helps. Bring “fidget toys.” Adams encourages caregivers to pack toys that the child may enjoy or even need to calm down. Choose your seat wisely, but don’t be afraid to move. Sit toward the back if your child tends to get overwhelmed quickly. Sit by an aisle if your child needs to move around. 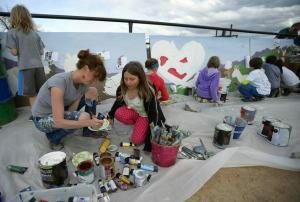 Kids in a Boulder County community arts program tackled a five-panel mural on Sunday, painting the rescued farm animals living at Lafayette’s Luvin Arms Sanctuary. “The kids can share their experiences,” Delano said. K-Lee Atwell-Stoltz, whose daughter Abi Atwell takes ARTism classes, said there’s not much available for typical siblings of kids with special needs. Leading the farm mural project was Lafayette muralist Sarah Spencer, who volunteered her time. She previously helped them create a “Where the Wild Things Are” themed mural on a shed in Lafayette. Spencer sketched out the mural, then let the kids paint the background and fill in the animal outlines with paint. Once they’re finished, she plans to go back and add highlights and details. “Kids are great artists,” she said. Felix Feiger, who’s 11 and lives in Boulder, painted one of the goats. The group chose Luvin Arms Sanctuary for their second project because ARTism’s co-founder Marshall is a regular volunteer. Plus, Luvin Arms founder Shaleen Shah said, the sanctuary is all about community. Shah said he and his wife, Shilpi Shah, started by rescuing horses, first taking in a horse named Jale (short for Jalapeno). Next came Niblet, a pony rescued from a slaughter auction, and then Bell, a mare with two foals who also was at a an auction. At the auctions, he said, saw “1,000s of other farm animals” in need of help. “We just had this wish to do more,” he said. the sanctuary. More volunteers care for the 13 animals. PS A BIG thank you to Mike Hedlof at Lowe’s at the Orchard, and Valspar!!! Nine-year-old Jake Hostelley does not speak, but he has a lot to say. 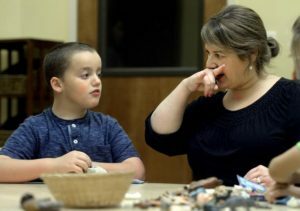 The Longmont resident has severe speech apraxia making it nearly impossible for Jake to express himself verbally. So, he signs. Jake has no problem communicating his thoughts through sign language, but sometimes it’s difficult for Kareny to keep up with her son, which is why this summer she started attending free signing classes in Lafayette. Sign-language interpreter Jennifer Kuzminsky launched the American Sign Language class in July to improve communication between counselors and clients with disabilities at Lafayette-based nonprofit Imagine!, where Kuzminsky worked during the summer. Now, Kuzminsky welcomes anyone seeking sign language education to the Monday night class. Lafayette resident Julie Marshall helps coordinate and promote the class, which her daughter, Sarah, inspired. Nearly six years ago, Marshall discovered her autistic daughter was responding to signs the pair memorized from a series of videos called “Signing Time,” which Sarah watched religiously. Marshall continued using signs she learned from the videos but a sign language teacher at school was expensive. Marshall shared the family’s challenges with Kuzminsky during an Imagine! program and the class was born. Three months later, Marshall, Sarah, 11, and Sarah’s sister, Jazzy, 8, were signing to each other on a playground while they waited for Monday’s class to begin. Kuzminsky leads the informal sessions that focus on casual signing lessons based on the needs of participants and offer a relaxed environment for children and adults. 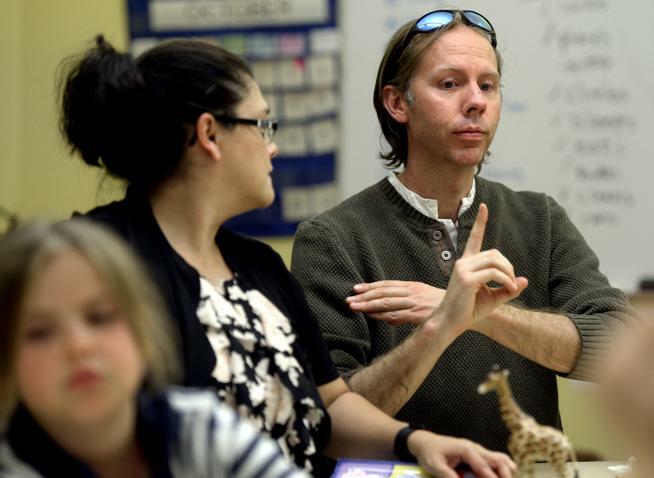 This week, at New Church of Boulder Valley in Lafayette, which donates classroom space for the sessions, the Marshall family was joined by three other families ready to work on their signing skills. Like the Marshalls, Erika Herreria and Kurt Dunlap are regulars hoping to ease communication with their 2-year-old son, AJ Dunlap Herreria. AJ has Down syndrome and permanent damage to his left ear, making it difficult for him to hear, Herreria said. Despite his young age, verbal communication will likely continue to be a challenge for AJ , which the family seeks to overcome using sign language. Herreria has noticed a difference in AJ’s behavior since they began using signs. Sign language also is helping AJ learn verbal speech. Herreria said AJ often repeats words as a supplement to signs he performs. Many participants in the class use signing as a supplement to speech — “just another form of communication,” Kuzminsky said. But not Jake. Jake knows more than 350 signs he uses to talk about Halloween costumes, his favorite colors or what he wants for dinner. Hostelley said the Monday night classes help her remember the basic signs she might not use everyday and often forgets. But more than practice, Hostelley said the sessions provide extra support and encouragement the family has not found anywhere else. Olga Kern’s black gown cascaded over the grand piano bench, her hands engaged in a fervently romantic dance of notes penned by Rachmaninoff. Like a great personal gift, the virtuosa conjured melodies that soared high into the balcony where I sat with my daughter, Sarah. The pulsing harmonies made it difficult to sit still in our plush velvet chairs. For my 10-year-old with severe autism, the task was impossible. Like most children diagnosed with autism disorder, Sarah is compelled to awkwardly move her body in space and make strange noises, which explains why families like mine are banned from experiencing the performing arts. Our collective experience is a virtual sign in every lobby: No Autistic Kids Allowed. Sarah constantly rocked in her chair that night and waved her hands as if conducting a symphony orchestra. Music has been a profound experience for Sarah, who at age 3 could sing her ABCs and “Twinkle, Twinkle, Little Star” pitch-perfect, but could not speak a coherent word. Watching Sarah absorb Kern’s performance was an “A-plus” parental moment. “We had the most spectacular autism-friendly performance of ‘The Lion King,’ and we have had many groups from across the country reach out for guidance on how to replicate it,” said the group’s president, Liz Feld. The Colorado Conservatory of Dance stepped up last winter with its stunning, autism-friendly performance of “The Nutcracker.” And I can hardly wait for Simply Music, a national innovative music curriculum, to come out with its Gateway program, which teaches kids like my daughter to play the piano. In our house, I’ll often hear Sarah improvising random little melodies on the piano. Like every difficult challenge she has faced, I know she will one day play. Our children are intelligent, capable and motivated; they just need access to opportunities. And providing access to music is life-changing. 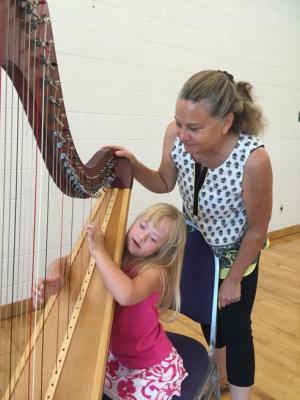 Harpist Pam Eldridge was floored the day a boy walked up to her harp after a concert and effortlessly plucked “Twinkle, Twinkle, Little Star.” He’s now her student. Whenever she gets bogged down with life, performing for kids with autism is “what lightens me,” she says. “Autism-friendly” can mean softer music and low lights for kids with heightened sensitivities, but most of all it means acceptance. It means the concert is for our kids, our families. We are center stage, not relegated to some remote and dark corner where we won’t be “bothering” anyone. And we won’t ever have to apologize or explain. 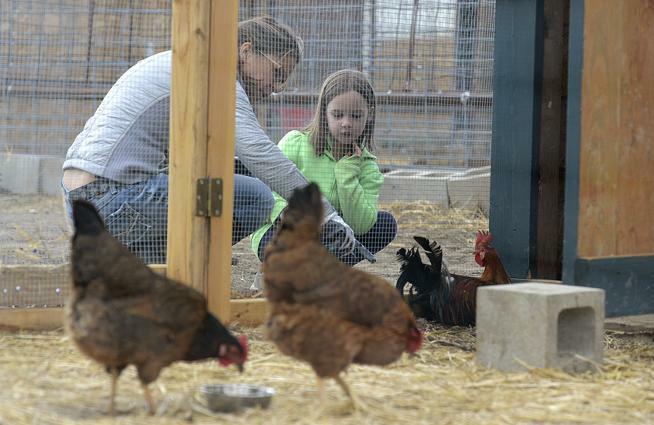 Julie Hoffman Marshall of Lafayette is mom to Sarah, 11, and Jazzy, 8. The Colorado Symphony appreciated reading Julie Hoffman Marshall’s story about the experience with her daughter at a 2014/15 season Colorado Symphony Masterworks concert. We were thrilled to read about how connected to the music of Rachmaninoff her child was, rocking in her chair and waving her hands to the sound of the orchestra. That being said, it was troubling to read about her negative experience with the usher assigned to her section. The ushers are not employees of the Colorado Symphony, and an inquiry to the management of the ushers (the Denver Performing Arts Complex) has been initiated. The challenges she and thousands of other families face when caring for loved ones with autism need not include feeling “banned from experiencing the performing arts,” as she wrote. In fact, recently the Colorado Symphony’s community and education programs department has been working on scheduling sensory-friendly performance experiences specifically designed for patrons who may exhibit atypical audience behaviors. Eleven-year-old Cata Maiocco chimes in echoing Jazzy’s sibling challenges. “My little brother puts my toys down the toilet,” Cata said, sending Jazzy into a fit of laughter. These conversations are the reason why Jazzy’s mom, Julie Marshall, co-launched an art therapy program for siblings of children with disabilities. The program kicked off in January at Lafayette’s Church of the Arts with support from Lafayette-based nonprofits Project YES and The Association for Community Living and driven by Marshall and art therapy student Megan Delano. The 12-week program moved to a donated room at the YMCA of Boulder Valley in Lafayette to accommodate growing attendance. Classes will continue Sunday afternoons through May 3 and organizers are hashing out the details for a monthly summer session and weekly fall session. Lafayette potter David Beumee taught nine elementary and middle school students how to make clay plates during the March 29 class. Previous sessions have included acrylic painting with Louisville’s Michael Symber, cloth books and papier-mache masks. Cata’s mom, Rosario, said the family’s schedule is always dependent on her autistic son, Lucas, which makes daily activities difficult for Cata and her sister. Boulder 6-year-old Aurora Wilson-Patterson was quiet as she added designs to her plate and listened to the other children tell stories about silly things their siblings have done until one of the children talked about her sibling’s aversion to green food. “My brother always eats Popsicles and he always takes two and they’re always orange,” Aurora tells the group before returning to her project. 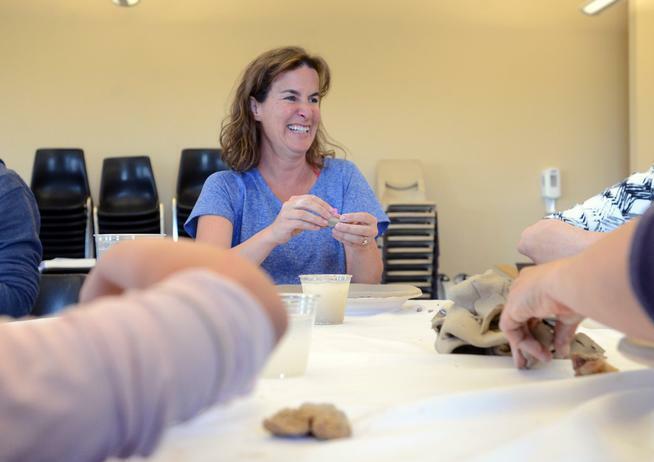 The conversation bounced back and forth between art and autism seamlessly transitioning from the clay coil that lined one student’s plate to the her sibling who refuses to wear clothes lately — another successful class, Marshall said. “This is what we hope for,” she said. daughter to an unusual “Nutcracker” ballet specifically performed for kids with autism and disabilities that make it impossible to sit still, be quiet and blend in. What unfolded was magical and more than I could have possibly anticipated. When the professional dancers from Wonderbound (formerly Ballet Nouveau), along with students from Colorado Conservatory of Dance, took the stage, my 10-year-old daughter, Sarah, stood up and moved closer. Row by row, she was magnetically pulled toward the beauty of Tchaikovsky’s masterpiece and the athletic movement in front of her eyes, until she reached the first row and parked herself there for 90 minutes. Sarah has severe autism and rarely focuses her attention. But on this night, she was mesmerized by the rare gift of this 2014 season. Her intermittent jumps for joy and squeals were met with smiles, because the performance was built for kids like her. No one told me to make her sit down, or be quiet. She experienced the night body and soul, and I was in tears watching from the sidelines. After the show, a father told me how much he enjoyed watching Sarah. Julie Wilkinson Manley, the school’s artistic director and CEO, told me how much the performance meant to her dancers. The lights were on; the music was soft and I noticed the dancers were smiling beyond a stage affect due to the feedback from all the children who, like Sarah, were twirling in the aisles and making joyful noise. This was a rare event of liberation for families like ours, whose kids cannot enjoy the arts. Shameful stares from concertgoers keep us at home, as if it were our parenting style rather than the manifestation of autism that is driving our kids to express who they are. A friend told me last week. “society won’t change,” but I disagree. And this performance is proof that there are amazing people who understand the immense joy of dance and music, and the profound effect it has on children who benefit wildly from immersing themselves in the moment. If there is a universal message here, it is that our kids deserve to be treated to the same high quality of the arts as all children. They feel it; they experience it, they love it. There is no better joy for a parent than to see a child so blissfully happy. Thank you, Colorado Conservatory of Dance, and I hope your example proves fruitful for many more sensory friendly performances throughout Colorado in music, dance, and more. Julie Hoffman Marshall lives in Lafayette. Piper Conducts! A VIDEO of Brainsong No Shushing Concert featuring the Colorado Symphony Orchestra Ensemble led by Catherine Beeson!